These two pictures - taken at a Border Post on the Iranian border, a little south of Zaranj in Nimroz Province 3 years ago- show soldiers being paid their salaries. This was for the benefit of a visiting team, of which I was a part. Notice the soldier leaning rakishly against that van in the background and sneering at the drama? This was just a sham to show how honestly the soldiers were paid their salaries. This corrupt farce is repeated in every aspect of the poor Afghan peoples' lives. Especially and most noticeably in the General Elections that were held on the 20th of August, 2009. A smiling voter holds his election ID card as he waits to vote in Kabul, 20 Aug 2009Millions of Afghans braved threats of Taliban attacks on polling stations and retaliation against voters to go to the polls Thursday. The legitimacy of the election is beholden to an acceptable turnout and the reported level of wholesale vote-buying, phantom voters and other acts of electoral corruption. Voting is taking place amid scattered explosions in the capital and other parts of the country." From my few friends in Afghanistan I have managed to piece together a different story. A story of deceit, propaganda, lies and more lies. A falsehood that has been white washed into a justification of the US policy in Afghanistan. It has not fooled the Afghans certainly. In south Afghanistan, especially Kandahar, Helmand and Nimroz less than 20% people actually voted. The Taliban had thundered vengeance if any one did. Yet ballot boxes are filled with votes to show that more than 50% did. Very few women turned up (the Taleban had pointedly threatened women) and yet many women seemed to have voted. Can any one, but the interested parties, believe this exercise? 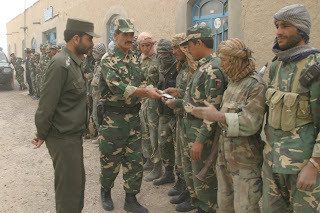 In North Afghanistan the elections did approach some sort of fairness. In Kabul the European Union election observers were not visible till 16.00 hrs. How could they then approve this election? In Spin Boldak, the Afghan town on the Kandahar-Quetta (Pakistan) Border 115% have apparently voted. Some election agent apparently got carried away! Yesterday, the 30th of August, came the news that there were fake votes stuffed in more than 550 polling booths. Where is the International Press that was so vigilant and righteously indignant about the fraud in the Iran elections. This fraud is apparently going to be 100 times worse and yet there is not a questioning squeak from the many journalists covering the Afghan Elections. Karzai is going to win the elections. Evey body can be rest assured, but by fixing it there is going to be no peace in Afghanistan at all. Abdullah Abdullah will be unacceptable to the Americans as he leans towards the Iranians, and thus is persona non grata. Just for show there may be an another round which will be won by Karzai. A known and corrupt evil is better than an unknown angel. The Hazara Ramza Bashardost, who is conducting his Honesty and Anti-Corruption campaign from a tent has managed to get about 10% of the votes. He is a popular figure for his brave stand for principles, and especially after he refused to see Holbrooke, the US Negotiator, inside the US Embassy as latter cheekily expected him to do. Bashardost aksed Holbrooke to meet him in his tent. People like him provide only a comic interlude to the dreadful prospect of continuance of evil that is the fate of the Afghan peoples.